Over the last decade, a marked shift in shopping behavior has fundamentally changed the retail landscape in the US and abroad. In 2019 alone retail giants like Gap & Victoria Secret, to name a few, have closed nearly 5,000 stores. This may have some retailers wondering what role brick and mortar stores will play in future of shopping, but there is more to the story than just store closures. In fact, many eCommerce brands are actually moving to develop a physical presence, and brands like Costco and Target are expanding their brick and mortar footprint. So what should retailers make of these changes? Considering that 77 percent of Americans have smartphones, adopting a mobile strategy may be the perfect plan to invest in a channel that isn’t going anywhere anytime soon. These numbers shouldn’t come as a surprise, yet many retailers still have not yet incorporated mobile into their overall strategy. For marketers working with brick-and-mortar stores, the rise of mobile can seem like the second coming of e-commerce: confusing, competitive, and forcing change in ways that few can predict. Mobile marketing, however, represents a fantastic opportunity to enable a seamless branded experience for customers wherever they choose to engage. The central challenge going forward is finding a way to be authentic and on-brand across multiple channels while working to connect them with meaningful content. 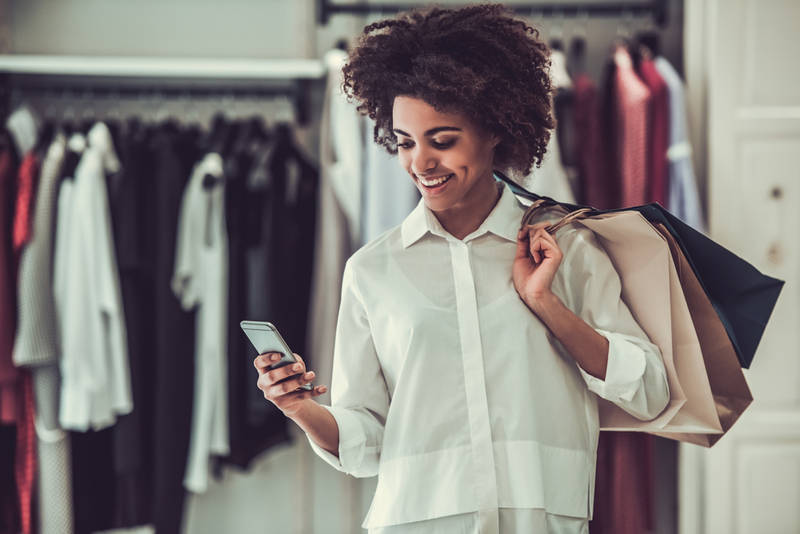 We’ve compiled 7 tips to help marketers integrate mobile into their loyalty and engagement strategies and bridge the gap between the online and in store experience. Stores have one great advantage over e-commerce. Their design, the music they play, and the style of the goods they sell all communicate valuable brand messages. There is a stark difference between H&M and Urban Outfitters. Those brand attributes can be extended to the mobile channel by leveraging rich content like images, videos and creative copy to express the brand’s personality while creating a seamless omnichannel experience. Smartphones have opened many avenues for creative messaging. Mobile scratch-and-wins, dynamic video, and even a simple happy birthday message are great ways to engage loyal fans. Text messages have an 82 percent open rate. But if messages don’t fit customer needs, they’ll seem like spam and get turned off. Use data to measure what content is most engaging – whether it is shipping notices, mobile offers, or gentle reminders to read an email. The opt in process is a great time to ask for information that can be used to personalize future messages. Marketers today assemble solutions from dozens of vendors, each bolted on to the marketing stack — like Frankenstein’s monster — as needs arise. Look for solutions that integrate all the tools in a single platform, or that are connected and communicate with each other – sharing data and using events to trigger marketing activities across all channels. Loyalty programs are great tools for capturing data, but they can also provide a forum for marketers to connect store and mobile experiences. A customer might sign up in store, but give them the option to receive notifications of points value, expiring points or rewards earned via mobile message. When an online shopper buys something, entering her email address is just part of the checkout process needed to confirm orders and deliver updates. A well-designed loyalty program incentivizes brick-and-mortar shoppers to provide the same information, enabling the marketer to identify shoppers consistently across channels. The online, social, mobile, and in-store teams are often silos of data that never get shared. If each of these groups holds a different set of customer data, they’re only seeing part of the picture. Omni-channel shoppers can prove to be much more loyal to your brand, but marketers must prioritize technologies that can aggregate this information, allowing brands to more easily identify customers, study their motivations, and talk to them. Before e-commerce and mobile, calculating the return on investment of a physical store was relatively straightforward – it was based on sales. But today, the path to purchase is harder to track. A shopper might try on a pair of pants in the store, compare prices on their phone, then buy them online at home. But when all channels are working together, and you can see all the data in one place, the physical store is a valuable part of the equation, lending a certain credibility, and a host of brand messaging that influences and builds a relationship with shoppers. But with consumers accessing brand content in the digital and physical world, mobile is an important connector and a big opportunity to differentiate brands. The right strategy for a brand varies, and could mean developing an app, adopting mobile messaging as a direct communication channel or simply implementing a well designed mobile website. Ultimately, the choice depends on consumer expectations for brand engagement. But in all cases, a mobile strategy is essential to facilitate the seamless experience everyone wants.